2017-06-13 Another Regen Receiver Built – Success! The previous regenerative receivers I’ve built have been 27 MHz, but they have not been successful, they haven’t received a decent verifiable signal other than the very strong one I made with a dip meter. 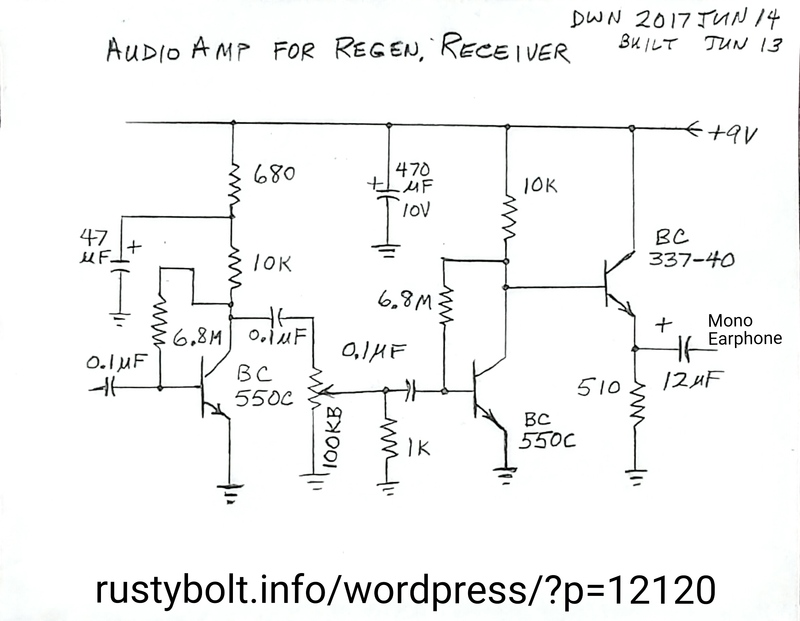 So this time I would build a regenerative receiver that is much lower frequency, and I chose 10.000 MHz because I can receive the WWV time signal most of the time on this frequency. Also the station is easily recognizable with its constant tones and beeps. I don’t know where I got this schematic, it was among the hundreds that I have downloaded over the last few months. It looks like it’s European design. I used everything from the left up to R4, but not T2 and its circuitry. I used a different circuit; instead of a JFET or RF transistor it used a regular BC548 BJT (bipolar junction transistor). I didn’t have a BC548 so I used a BC550C, which is a very high gain version. But the biggest change was the coil. The coil has a tap at 5 turns above common, so the power from the emitter can be fed back to make it regenerate. I used 24 AWG solid enameled magnet wire for the coil. I wound the coil on a wood dowel about 8mm diameter and 40 mm long. I drilled two small holes to hold the wire, using a 55 wire gauge drill bit. I wound 15 turns, twisted the wire to make a tap, then wound 5 more turns. I taped up the coil with black electrical tape. The coil measured a bit more than 2 microhenrys, which calculations showed it needed about 100 pF of capacitance for 10 MHz. I used ElectroDroid on my cellphone to calculate the coil size and turns and the L and C of the resonant circuit. The emitter resistor is 220 ohms, but a 10k multiturn trimmer pot is in parallel to tap off a small amount of signal and feed it into the tap, to adjust the regeneration . The collector load resistor was 100k, and the bias resistor between base and collector was 1 megohm. After I got it assembled, I adjusted the regeneration pot, but I got nothing. I measured the collector voltage and found it was only 0.94 volt. The rest of the 9 volts – more than 8 volts – was across the collector load resistor. I took a break for awhile and thought about what I had learned from the previous regenerative receivers I had built. All of them had been running at very low collector currents, and they seemed to work better after I increased their collector current. So I kept that in mind while I built a 3 transistor audio amplifier for driving the earphone. There is a big problem with running BJTs at low collector voltage and current; they are running at the point where their f<sub>T</sub> is at its lowest and they have a difficult time amplifying radio frequencies. So they don’t want to oscillate in the regenerative mode. The 3 transistor audio amp is two common emitter stages with the third transistor an emitter follower to give a low impedance output to drive the headphones. Both common emitter stages use BC550Cs and have a 10k collector load resistor. All coupling capacitors are 0.1 uF plastic. The bias resistors between base and collector are both 6.8 Megohms; I calculated the value and it gives about half the 9 volts at the collectors. I put a 100k volume control between the first and second stages. The emitter follower stage uses a BC337-40 (a BC547C is okay) with its base connected to and biased by the collector of the second stage. The collector is connected to +9 volts, and the emitter load resistor is 510 ohms to negative common. The output coupling capacitor is 12 uF, which seems low, but the small values for all the coupling caps are to reduce low frequencies below 300 Hz. To reduce high frequencies, I put a 220 pF from the input to common. I used a 3.5mm stereo jack for the output, and a 3 conductor terminal strip for +, – and input. After wiring it up to the power, regen stage and headphones, I had no problems hearing the hum from my finger. I also knew that the regenerative stage was amplifying because the coil was microphonic – I could hear it ring whenever I tapped it or moved it. It was trying to oscillate, so I guessed I was getting close. I decided to try more collector current for the regen, so I soldered a 22k in parallel with the 100k, which gave 18k total. When I adjusted the regeneration control, the noise increased until the audio sounded muffled, like passing through a low pass filter. I was getting excited! This is the first time I have ever had a regenerative circuit act like those described in literature from as far back as almost a hundred years ago! I checked the frequency with my dip meter, and when I tuned the dip meter to the receiving frequency, I got a very narrow blip in my headphones. The unmodulated dip meter’s carrier beat with the regenerative oscillations, giving a squeal. This was the first time I have had a regen circuit act right! I was finally convinced that the regenerative circuit could actually receive properly. I added a few feet of wire for an antenna, connected through a 5 pF capacitor to the collector. I tuned the frequency and I heard the “deedle-deedle-deedle” of a teletype transmission. I’ve been chasing after this sensitivity for months, and every time I got close, it would avoid me. My dip meter was showing that with a 100 pF fixed capacitor and a .5 to 5 pF variable, it was well below 10 MHz. So I unsoldered the 100 and put an 82 pF in. The dip meter showed it was above 10 MHz, so I added a trimmer cap to find out how much capacitance would get it to 10 MHz. With the trimmer almost at its minimum, the dip meter was showing about 10 MHz, so I knew it was going to need just 5 to 10 pFs to get it right on. I removed the trimmer and it measured 11 and a fraction pFs, so I soldered a 10 pF silver mica in. These are very stable over a wide range of temperature, and they’re expensive – more than $2.00 U.S. apiece. I also knew that the high pitched noise and screechy sound meant I should increase the capacitor from the input to common. The regen’s collector is coupled to the audio input through a .1 uF capacitor in series with a 33k resistor. The resistor is to prevent the audio input from loading the collector. I think it might be better if I used two 15k resistors with capacitors to common to make a low pass filter. for now I increased the 220 pF on the audio input to 2200 pF and it helped. Right now I need to get it more integrated. The regenerative stage is just a jumble of parts wired point to point. The audio amp is on a piece of perfboard, so it’s okay. I need to put it on a piece of wood or circuit board to make it stable. For now, I’m just making some improvements on this one. Update Jun 14 – Even with the multiturn trimpot to adjust the regeneration, it’s still very sensitive; it takes only a fraction of a turn to make a big difference. This needs to be changed to a lower value pot, maybe 1k, with the rest of the remaining 9k on the resistors on each end of the pot. But the pot’s resistance needs to be measured, and that can’t be done until it’s removed from the circuit. The regeneration control and tuning interact slightly, and that should be considered. Right now the tuning capacitor is only 5 pF out of a total of about 100 pF across the coil. There is 82 and 10 pF silver mica caps and the 5 maximum pF tuning capacitor plus a few pFs from the rest of the circuit. I may need to add another 5 pF tuning capacitor. I noticed that if I get the headphones too close to the regen circuit, the audio will squeal, like feedback from a microphone. I’m not sure if the cause is from the coil being microphonic or if the magnetic field from the headphones is interacting with the coil. The coil is very sensitive to movement or touch. Update June 15 – I once read an article online that discussed how to change an audio volume control that doesn’t have a logarithmic taper to one that does by adding a resistor to it. Before I did this, when I turned the volume control pot up, it got very loud very quickly, only a fraction of a turn. So I added a 1k resistor from the center wiper lug to the ground lug. Now when I turn the volume control, it has to be turned to about a quarter turn to make it comfortably loud (see schematic). It works much better.